Secret NEW Clinical Strength Collection. Now that the holidays are over, it doesn't mean that I'm sweating any less. I think I'm sweating and stressing more thinking of everything coming up in 2014 already. Not only do I have resolutions to make and stick to, I have trips planned (one next week), new projects to keep my already over scheduled life even more busy, and my daughter will be leaving home and going to college this year. Those are just a few things to get me started sweating! Luckily, Secret has more Clinical Strength offerings to keep me covered. 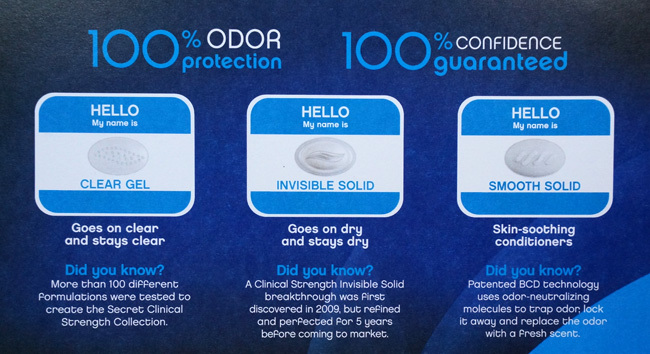 Originally, they only had the Smooth Solid, which I have used and depended on, but now there are two other formulas to round out the Clinical Strength Collection, which now includes a Clear Gel and Invisible Solid as well. This glides on evenly, providing high efficiency odor and wetness protection that is absorbed like a lotion. It contains skin soothing conditioners so skin is softened too. This serum-like formula has the maximum level of a patented calcium-stabilized active for optimized bioavailability that provides Clinical Strength protection. There is never the risk of white marks when using this either. This goes on dry and stays dry, but applies with ease due to surfactant waxes that are added to the formula. These also allow the active ingredients to release more efficiently so odor neutralizing molecules trap odor then lock it away. After using all three, I can say that all offer the same long wearing, all day round-the-clock performance and protection that I need and have come to depend on. I personally like the Clear Gel formula the best out of all of them. The Clear Gel formula applies clear and dries within seconds without ever feeling sticky. 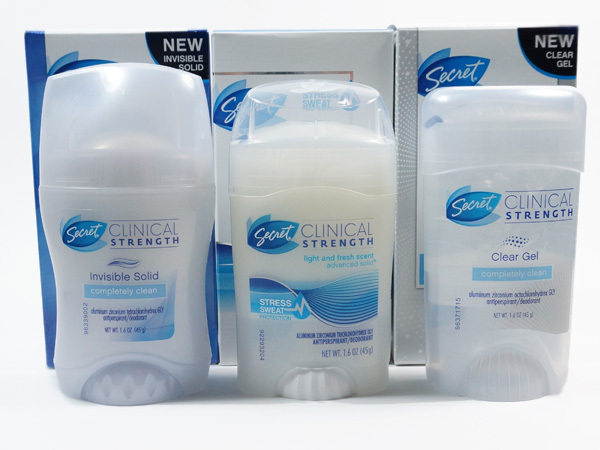 Each Secret Clinical Strength Antiperspirant/Deodorant sells for $7.99 and are available at SecretStore.com and your favorite drugstores and mass retailers now.